This is new technology that allows artists to take a single still or several still photos to create a 3d ray traced model and then map the texture from the photo on to the model. This method can create some stunning photorealistic 3d effects. I have tried several applications to achieve this effect, Photomodeler, Photo3d, and others. So far the best tool I have found is Canoma. The Night Cafe . 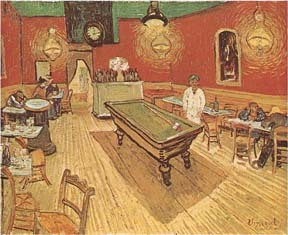 . .
As you can see in my first example this technique is not limited to photos I based the model on Vincent Van Gogh 's painting "The Night Cafe in the Place Lamartine in Arles" I heard a wonderful story that the green tint in this painting was inspired by the green absinth that he was drinking durring this period of his life, not sure if it's true but my next model may start in a bottle of absinth. My second model is a bit more ambitious. 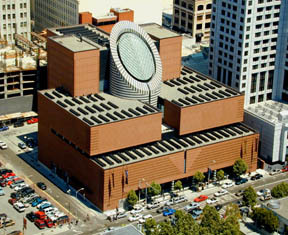 It started as a model of the MOMA (Museam of Modern Art) in San Francisco designed by Mario Botta . The Project has been growning in size to include the whole Yerba Buena Center and continuing into the Business District (not yet published). The plan (at least right now) is to make a very complete model that I will use to create transition movies between a series of 10-15 qtvr nodes. You can see the my first example of two qtvr nodes that are linked with photo modeled linear transition on the right. This is more of an experiement in technique than an artistic experiement. Other Immersive artists/researchers may find this interesting. If you are interested in having your site turned into a photorealistic Model for Internet or CD-ROM delivery contact me or go to my website. Experimental Proof of Concept: Cubic Panoramas from Ball Bearings and Immersive Environments with Canoma.